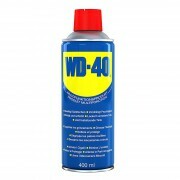 WD-40 400ml Aerosol Product Description Wd-40 protection spray WD-40 is a mixture of chemical concentrates suspended in a high grade petroleum distillate. Will not affect fabrics, rubbers or plastics. Its working temperature is between minus 100º F and 300 degrees F. WD-40 is an all ..